Best Bean Bags For Adults: Grab Them Now! 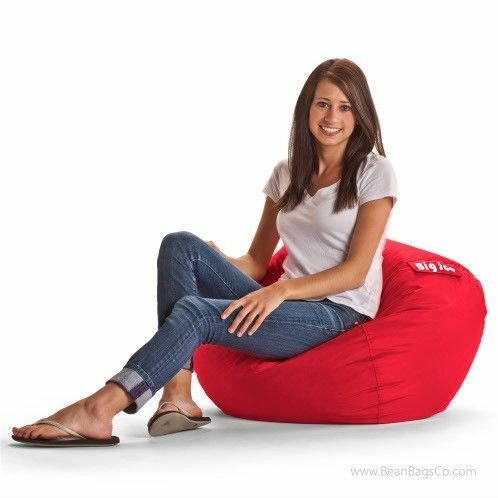 Home » Bean Bag Chairs » Best Bean Bags For Adults: Grab Them Now! We all know that it is difficult for us to seat in a chair in a straight position for hours but that’s what office is all about. Now that you are back from office and still have some work left to do, do you want to sit in the same position as you sat for 8-9 hours straight and work? People suffer from back aches and don’t feel like working after they are back from work because they don’t feel like sitting anymore and working on the bed can actually make you fall asleep. So, what are you supposed to do? Well, this is the reason why some great designers introduced Bean Bags in the 1960s and we can’t thank them enough of how grateful we feel because of the invention. What is a Bean Bag? Bean Bag is a more comfortable version of Sofa which is a bag lounge like bag full of dried beans or polystyrene beads to be used for sitting purpose. Apart from sitting they are also used for various other purpose like chilling, napping and snuggling. They are the cute versions of sofa that make a room look cool and stylish. They are just like any other piece of furniture we use at places. 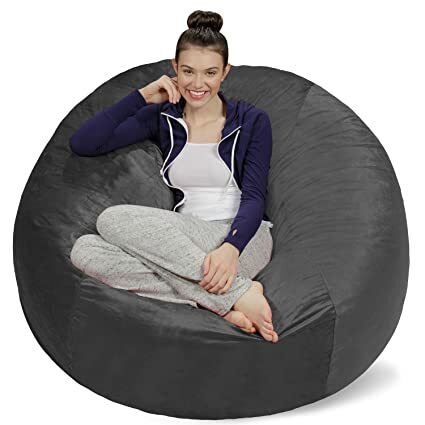 Bean Bags are available in all types of patterns and size options as well as color options so, when you are specific on buying a bean bag you should be specific about the purpose of buying it. Right from your budget even though they are inexpensive to the type of use you are buying it for regardless of the fact that they are multipurpose, Bean Bags have loads of benefits to offer. If you have been suffering from Back Pain then these Bean chairs serve as support and comfort, if you want to chill like you are lying but not sleeping while playing a video game then bean bags are exactly what you need. The best part about bean bags is that they are like therapy to our body and moreover they are so much easy to clean. Bean Bags are so much comfortable and relaxing especially when you just need to have something cosy all by yourself. The Big Joe Bean Bag has been made of tough fabric which no wonder allows comfort and is resistant to stain as well as water. You can move and place it wherever you want because handling this Bean Bag becomes easy owing to the built in handle so, you are always ready to grab and go. The best part about this Bean bag are the built in pockets where you can keep water bottle, or your phone or remotes handy. The covers can be refilled as per your requirement. The refill bag is very much durable and safe to use, thanks to the double stitched covers along with two safety locking zippers. It can be easily cleaned because all you have to do is use a damp cloth to wipe it off. It is not going to hold its exact form for too long. This Oversized Bean Bag is exactly the kind of comfortable chair that you prefer for hugging. This one is a great companion if you have planned “Netflix and chill” with your partner or friend. Whether there are adults or kids, this Bean bag suits both and forms to fit to their body. You can also prefer having some power nap on this cosy bean bag. The covers of the Chill Sack Bean Bag is very soft and sensuous to touch. It has been made out of high quality fabric and to provide durability to the bean bag, it has further been double stitched. What makes this bean bag comfortable and cosy is the fluffy US foam. The micro fibre covers are very soft and smooth to care. You will get over your sofa when you gain an access to this comfortable piece. The covers of this bean apart from being soft and smooth, are machine washable too. The Bean Bag is also resistant to dust, discoloration and stain. This Bean Bag is not big enough to provide you with back support while you are seated. The Posh Large Bean Bag Chairs have been ideally designed for all the kids who too deserve some comfort like the adults do. While growing up kids like the idea of chilling on a bean bag and enjoying their favorite shows and why not? After all their age exactly deals with chilling and not worrying. 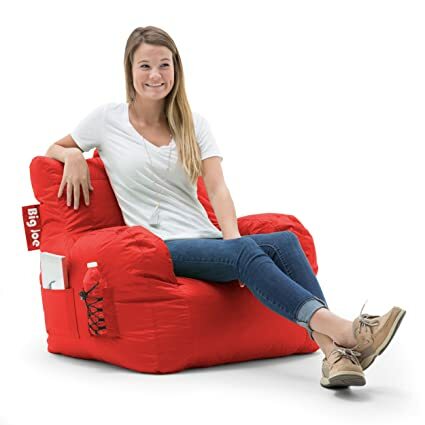 Even the growing teens can use this bean bag for studying or simply chilling purpose. The Posh Bean Bags have a 100% PVC polyester fabric cover which has been filled with polystyrene beans so, overall it is a comfortable and durable bag chair. It is of the perfect size for kids, teens as well as for the adults. They are available in plenty of color options to suit your home space be it bedroom, hallway, drawing room etc. 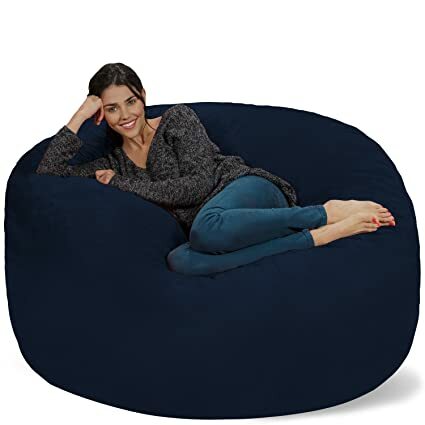 Right from reading to watching television to working on laptop, this bean bag has been made perfectly comfortable for literally all types of activities. The 27 inch bean bag can fit into any space of your house or office and both adults and kids can fit into it. The stylish patterns and 20 color options make it fit for any place. The Posh Bean Bags haven’t gone too well with the customers when it comes to durability of it. They became flat within weeks of regular use. The Big Joe Bean Bags have been everyone’s favorite, all because of the supreme quality and comfort it provides. With SmartMax fabric it becomes a water resistant bag which can be easily cleaned using a damp cloth. Also this bean bag provides comfort from all sides and not just to the back. This one has been ideally designed for both kids and adults of the house who jump around on the sofa seats, and if your kid has siblings then you are going to have a hard time in solving fights about who should seat first and why. There are color options too so you can buy one in a color that you likes or matches the accents of your room. For maximum strength and durability the bean bag has been double stitched and there are double zippers as well. This bag is strain resistant so one doesn’t really have to worry about stains. Since it has been designed for the kids so it can only manage lightweight and is not fit for adult use. This one has been designed keeping in mind the bedroom need on how people add comfort zones in their bedroom spaces. Sofa Sack Bean Bags are medium sized bags with ultra soft covers and comfort lurking from all sides of it. They are regarded as luxurious items because when we mention luxury we mean supreme comfort which is exactly what this Sofa Sack is all about. The color option feature is what makes this fit for any room. The best part of this sack is the no bean thing, that is there are no beans in the bean bag; instead there are memory foams which are more durable and withstanding than the beans. The fluffiness of the memory foams last longer and make you feel much better when you lie down on it than a bean bag does. It can bear all types of weight and still stands supportive owing to the durable stuffing and double stitching. Its versatility makes it convenient for the users to use it for different purposes whether it is napping, reading or just chilling. Since the bean bag uses memory foam as filling so you cannot expect it to be too soft like a bean bag usually feels. Bean Bags can be used for different purposes by different types of people. They can be used either just to add show to your home’s or office’s lounge or it can be used for when you organize movie dates for your friends, family or partners. In spite of the fact that it is versatile in nature, what matters the most is comfort whether you use it in your study or drawing room or bed room. And, all bean bags are designed with the same purpose of providing comfort to the users plus the other features. The other features is what makes one product different from the other. The five products as described as well as differentiated above are all the best sellers of Amazon. One can buy any of these depending on his or her need, reviews from other customers and most importantly by focusing on their budget. Follow Bean Bag Blog on Facebook, Twitter, Instagram and Pinterest! What Is The Best Bean Bag Filling? Is using a bean bag chair good for your health? 2018 BEANBAGBLOG.com. All rights reserved.